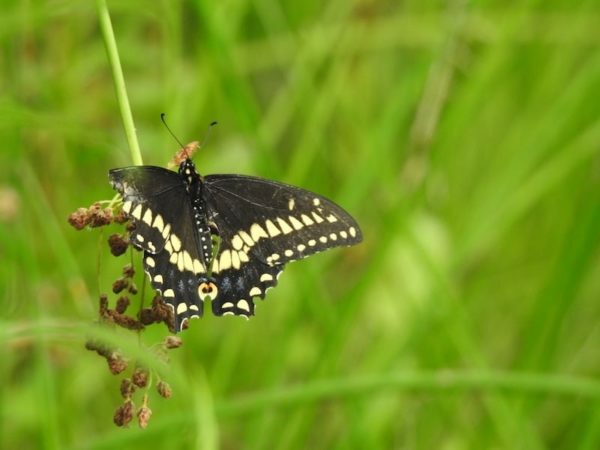 On our walk today, I spotted this male Eastern black swallowtail butterfly (Papilio polyxenes asterius) flitting about among the swamp milkweed and chased it down for a closer look. Much to my surprise, I found a creature with some serious battle scars: it was missing half of its left upper wing and its left tail was amputated. Nonetheless, it was flying just fine, at least far as I could tell. If you’re curious why I said it was male, it’s the size of the yellow spots. Males tend to have yellow spots that are larger than their blue spots, while females tend to have yellow spots that are smaller.